— Robert Berman, CEO, Hancock Jaffe Laboratories, Inc.
[ORLANDO, FL., August 16, 2018] — Hancock Jaffe Laboratories, Inc. (Nasdaq:HJLI) (Nasdaq:HJLIW), a company specializing in bioprosthetic medical devices to establish improved standards of care for treating cardiac and vascular diseases, has selected bioaccess.™ as its contract research organization (CRO) for a first-in-human clinical trial of its VenoValve® bioprosthetic medical device. The clinical trial will be conducted at Cirulaser Andes (“Cirulaser”) in Bogota, Colombia — a specialized vascular center affiliated with Hospital Universitario de la Fundación Santa Fé de Bogotá ("FSFB"). FSFB owns a 205-bed university hospital in Bogota, and was the first hospital in Colombia to receive the distinguished Joint Commission International accreditation; FSFB also boasts an academic affiliation with John’s Hopkins Medical International in Baltimore, MD. bioaccess.™ will assist Hancock Jaffe to obtain Cirulaser’s research and ethics committee approval for its planned VenoValve’s first-in-human trial. 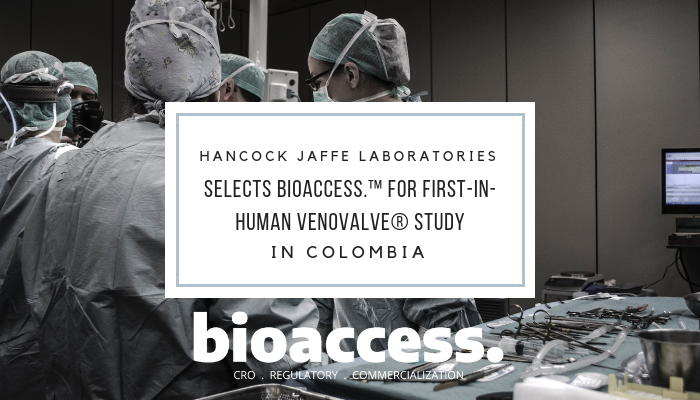 bioaccess.™ will also handle the regulatory submission to help Hancock Jaffe obtain Ministry of Health (INVIMA) approval in Colombia; along with the importation of the investigational devices, project management, study monitoring, and other necessary activities to ensure a successful trial. No specific time frame is being announced for the approvals, however, the companies expect to have all necessary approvals and paperwork in place to begin recruiting patients by the fourth quarter of this year. Hancock Jaffe is developing the VenoValve® to treat severe cases of chronic venous Insufficiency (“CVI”). CVI occurs when the valves in the in the veins of the deep venous system of the leg are injured or destroyed, causing blood to pool in the lower extremities, which leads to swelling, debilitating pain, and skin ulcerations. Practitioners rate the severity of CVI based upon a system known as CEAP, which stands for Clinical-Etiology-Anatomy-Pathophysiology and has a rating system of C0 to C6, with C4, C5, and C6 being the most severe cases. Approximately 4.5 million people in the U.S. suffer from severe CVI, and the condition results in over 700,000 hospitalizations per year. There are currently no FDA approved treatments for deep venous CVI. The VenoValve is a porcine based valve developed at HJLI to be implanted in the deep vein system of the leg. By reducing reflux, and lowering venous hypertension, the VenoValve has the potential to reduce or eliminate the symptoms of deep venous, severe CVI, including venous leg ulcers. Initially, the VenoValve will be surgically implanted into the patient on an outpatient basis via a 5 to 6 inch incision in the upper thigh. There are presently no medical or nonsurgical treatments for reflux occurring in the deep vein system. Compression garments or constant leg elevation address the symptoms, but ignore the underlying cause. Compliance with compression garments and leg elevation is extremely low, especially among the elderly. When CVI is isolated to the superficial veins, ablation or surgical excision of the affected saphenous vein is an option. For the deep vein system, valve transplants have been attempted but with very-poor results. Another potential option, the creation of valves using fibrous tissue, has only been performed in few centers worldwide. We believe that the reestablishment of proper direction of venous flow to the heart is the only reasonable remedy to the problem of reflux based CVI. Currently, however, there is no known devices or medicines available that would restore venous flow in the deep venous system. The initial potential U.S. market for the first iteration of the VenoValve are the 2.6 million severe CVI sufferers with deep venous reflux. Future iterations of the VenoValve may also be appropriate for the superficial vein system, which would increase the potential market to all of the 4.8 million severe CVI sufferers with deep vein or superficial vein reflux. The Journal of Vascular Surgery Venous and Lymphatic Disorders published an article on present and future options for treating deep vein disease. The article features the Hancock Jaffe’s VenoValve® implant. The Journal of Vascular Surgery Venous and Lymphatic Disorders is the official peer-reviewed journal of the Society for Vascular Surgery and the American Venous Forum. The article titled “Present and Future Options for Treatment of Infrainguinal Deep Vein Disease” addresses post thrombotic syndrome, a disease that occurs when a blood clot in the deep venous system creates chronic venous obstruction, reflux, or a combination of both, a condition that afflicts approximately 4.5 million people in the United States alone. The article focuses on the limitations doctors currently face in their ability to treat post thrombotic syndrome through existing measures, such as compression stockings and leg elevation. The article goes on to describe thrombotic syndrome as an “area of intense interest” among the vascular community and as “the final frontier in venous disease.” The article highlights Hancock Jaffe’s VenoValve® as a potentially curative treatment for venous reflux; a large and unmet medical need. Hancock Jaffe has had several Pre-FDA meetings to discuss the pre-clinical and clinical pathway for FDA approval for the VenoValve. Preclinical prototype testing, including in vivo animal studies, and in vitro hemodynamic studies, have demonstrated that the VenoValve mimics the function of a normal functioning venous valve. In preclinical studies, the VenoValve has passed the following areas: hemolysis, complement activation, platelet/leukocyte, thrombogenicity, cytotoxicity, and corrosion resistance. Moreover, the VenoValve has functioned normally in animals as shown by venograms as well as with intravascular ultrasound evaluations, and has also functioned normally under various conditions in hemodynamic testing. Ascending and descending venography of the VenoValve in pre-clinical studies has demonstrated competency of the valve as well as being open in appropriate flow patterns. Based upon feedback from the FDA, Hancock Jaffe agreed to conduct a small first-in-human study of between 5 to 10 patients for the VenoValve overseas prior to initiating a pivotal U.S. trial. This first-in-human study will provide Hancock Jaffe with valuable feedback to make any necessary product modifications or adjustments to its surgical implantation procedures prior to conducting a U.S. pivotal trial. Patients in the first-in-human trial will be monitored at regular intervals. Endpoints for the first-in-human VenoValve study will include improvements in reflux time, as well as rVCSS measurements, VAS scores, and VEINES scores, three well known clinical assessments for venous disease and assessments of improvement in the patient’s quality of life and reduction in pain. Duplex scans will be used to measure reflux time. A duplex scan, also known as a doppler test with ultrasound, is a non-invasive evaluation of blood flow through veins and arteries. On average, patients without CVI have reflux times of about 1 second, with reflux times increasing with the increasing severity of the disease. Improvements in reflux times will be expressed as a percentage of the original duplex measurement. Hancock Jaffe specializes in developing and manufacturing bioprosthetic medical devices to establish improved standards of care for treating cardiac and vascular diseases. Hancock Jaffe currently has three product candidates: the porcine tissue based VenoValve®, which is intended to be surgically implanted in the deep venous system of the leg to treat chronic venous Insufficiency; the CoreoGraft®, a bovine tissue based off the shelf conduit intended to be used for coronary artery bypass surgery, and a porcine tissue-based heart valve, which based upon its relatively small size and increased output, is an ideal candidate for pediatric aortic/mitral valve replacement. More information at www.hancockjaffe.com. bioaccess.™ is a Florida-based clinical research organization (CRO) and market access consulting company which mission is to help innovative life science companies conduct clinical research and commercialize their innovations in Colombia and the rest of Latin America. The company will provide Hancock Jaffe with support services (e.g., regulatory submission, logistical support, project management, and study monitoring; among others). More information at www.bioaccessla.com.